To reserve your Valkyrie Cane Corso puppy, call today (228)323-1256. Welcome to Valkyrie Cane Corso. We are a licensed, registered breeder, and connoiseur of the Cane Corso, an ancient breed for centuries known only to rural farmers and hunters of Southern Italy. Our dedication to preserve the Cane Corso is matched by no other breeder in the United States. Our kennels are nestled in one of the most flourishing farm communities in the world. Located on a forty acre farm with a beutiful twenty five acre pasture and broad terrain setting rich with rolling hills, creeks, and ponds but surounded by hard woods. Our dogs receive exposure to various livestock and wild game. As hunters and farmers, we maintain the intentual purpose of this breed set near 2000 years ago. The Cane Corso is a rare, ancient breed that has been making a come back over the last 20 years. The Cane Corso is full of expression, confidence, and loyalty. They are a companion, and want nothing more than your affection. In pairs, they play without limits. They will run, tackle, mouth, gnaw, jump, dive, and bat at each other. It will sound like horses playing football and if you could imagine, they are equally entertaining. They are so full of life, spirit, and charm. They will grab your heart and become a very loving addition to your family. They will defend their home and family with-out fear. When trained they become a very valuable asset to your home security. They are naturally weary of strangers, so socialization is very important, especially if you expect guest to visit your home. Most visitors will be naturally fearful of the Cane Corso due to it’s intimidating size and appearance. Training and Socializing is a building block to a very responsible relationship between you and your dog. It also helps with public awareness. The above organizations are not a reference of endorsement but are links provided for educational purposes as well as support. The knowledge stored in their data bases are extensive toward the breed, health, activities, and registries. 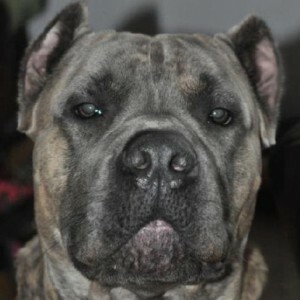 We recommend all Cane Corso owners and future owners to join one or more of the above organizations. An educated owner is a responsible owner.